The following is a translation of the information sheet released by Rabbi Moshe Vaie Shlita on 4 Tishrei. Click the hyperlink to view the original Hebrew document. Sukka scach (thatch?) is often infected with insects that may fall into food below. The Aruch Lanner (תוספת ביכורים סימן תרנ”ז) already warns us of this regarding hanging flowers from scach for they may fall into food and this in unavoidable, leading to ingestion of the insects in the flowers. At the time of purchase or prior to placing the scach on one’s sukka one holds the scach vertically over a clean white surface [such as a roll of white paper or white table cloth] and one beats the scach firmly and inspects to see if insects have fallen onto the white surface below. If the scach appears clean no additional labor is required, however if this is not the case, one take the following steps to clean the scach. Regarding green scach such a palm leaves, one is likely to find small insects on the green leaves. If this is the case, one places the leaves on the ground and brushes the leaves with a water/bleach solution on both sides, then following up with a total rinse of clear water. This refers to the mats of bamboo and the like, where one often find moths and other insects. In infected scach one may find the lyctus, which is dark brown and about 3 millimeters in length. It burrows entangled tunnels into the scach and this may lead to seeing a considerable amount of sawdust under the outer layer of bamboo. Book lice (?) ( כיני ספרים) are small, about a millimeter in length and grayish/cream in color. They are more often found in scach stored from year-to-year but this does not mean one will never find them in new scach. To remove these insects one leans the open scach against a wall and pours very hot water on it for about 15 minutes. The same is done to the second side for 10 minutes. 2. Clean scach can be treated in the home to avoid becoming infested. One can spray it with long-acting pesticides such as K600 or K2000 if they are totally dry prior to storage. It must be placed in a hermetically closed casing like the nylon bags sold for storage or a plastic wrapping closed with wide tape. The bags in which scach is often sold do not meet the qualification of a hermetic seal. If is preferable to add camphor balls to the storage package. The storage facility should be dry. The scach should be inspected prior to use the following year. NOTE: At present, one cannot find scach with a certifiable hechsher testifying to it being insect free. Additional information and photos are available in the rav’s book, “Bedikat Mazon K’Halacha” in Hebrew and “Bedikas Hamazon” in English, Volume 3. Posted on September 10, 2013 by JKN Israel. This entry was posted in General Interest. Bookmark the permalink. I would respectfully put forth to this rav that spraying pesticides in the home or on something that will be contaminating the air where one sits, breathes and eats is a known hazard because pesticides are poisons that cause told amounts of diseases. It is a matter of pikuach nefesh NOT to spray these pesticides in your homes, especially around developing children and/or pregnant women. I have never heard of this rav, but I will ask mine if I need to pay heed to this. I agree with Aviva, NOT to use bug spray that one could breathe in while eating, be careful of allergies that stop one from breathing from bug spray, and ESP if the sun is strong and or it rains and then drips all over inside the sukka! 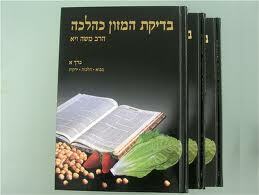 Craziness, poison on our salads, veggies, sukkot! What is next? 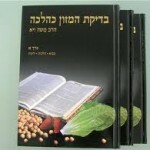 Excuse me, but are the Rabbis really asking us to poison ourselves voluntarily? And how does one get 10 minutes of hot water to flow over the entire bamboo mats, on each side … Outside one’s home? I don’t see how this is feasible. Never was this a crisis in Boro Park. Never were we given such warnings. Are people not to walk under trees, visit parks, the zoo, botanical gardens for fear of bugs landing on one’s person. Think for a minute about this! it is most interesting that in no previous generations did anyone ever consider checking schach for bugs. I think that you are losing your mind . What would the hechsher help? Bugs can get into the schach afterwards. The issue is actually quite reasonable, if you think about it. You are sitting for hours underneath the schach. It’s very likely that bugs in an infested batch of schach to fall on the table, a table laden with food, it is even likely that a bug will fall into the food itself, and then subsequently be eaten. Having been at a few succos meals, I can tell you that there are a lot of bugs falling on the table in general. I can only imagine how bad infested schach exacerbates the issue. If you don’t want to use bug spray (for that matter neither do I!) you can always buy another type of schach (some people use wood slats), or alternatively spray the mats well before you need them so that they have time to air out. As for why there aren’t warnings in Boro Park, maybe these bugs aren’t indigenous to the US? Please just stop and think! ” Are people not to walk under trees, visit parks, the zoo, botanical gardens for fear of bugs landing on one’s person.” big deal if a bug lands on you whats your problem? This spraying is for old “stored” suchach. just spray it NOW outside (actually you should have done it last week) and leave out side to air out till sukkas. I am not commenting on whether or not one must check/clean their schach and the pesticide issue. But I just want to note in response to “I have never heard of this Rav but” and the question of credibility: Whether you hold of his psak or not, Rav Vaie is THE authority on insect infestation in food in Israel. (not outside of Israel.) Even those who l’maaseh don’t hold of his psak and are more lenient regarding checking food for bugs look to his reports to know what the considerations are. Chana: In all fairness, the outcry was about the same when Rav Vaie came around with pictures explaining how to check your lettuce, but today everyone who buys “regular” lettuce knows you have to do it. My wife and I just checked our schach and found these little lyctus creatures all over the place. Not really sure how to practically go about this hot water business, but I definitely don’t want those things in my soup on Yom Tov, thank you.